"Sam Mayfield’s Wisconsin Rising is up-close and personal…and political. This slice of life, a moment in movement history, captures the struggles of the American Middle Class confronting the corrupting power of money over democracy. Don’t miss it." - Amy Goodman, Host & Executive Producer, Democracy Now! Wisconsin Rising documents the largest sustained workers' resistance movement in American history. Wisconsin was a testing ground for the nation in 2011 as big money attempted to undo basic workers' rights when newly-elected Republican Governor Scott Walker suddenly stripped collective bargaining power from the state's public employees. "Wisconsin Rising| captures the spirit and intensity of the dramatic events as they unfolded, and reminds us that we cannot predict the future, and we should not forget our past, even our recent past." 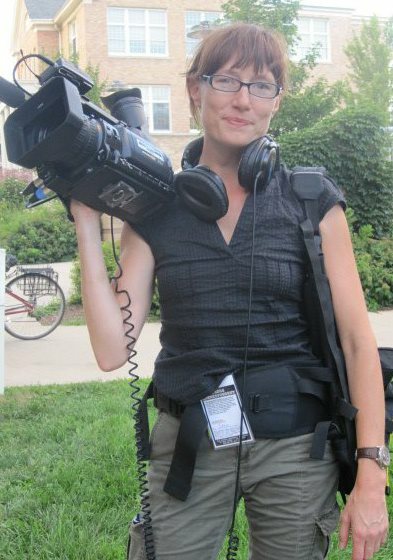 Sam Mayfield (Director, Producer, Camera, Editor) is a videographer, editor, and video journalist who has been documenting stories that remain untold by the commercial media since 2004. Her work has been broadcast on PBS, Democracy Now!, Free Speech TV and other progressive media outlets,and has taken her to Mexico, India, West Africa, and Palestine. In 2011, Mayfield traveled to Wisconsin to cover the popular uprising against legislation gutting basic workers rights. She went for four days and ultimately stayed seven months, documenting this piece of American history as it unfolded in front of her. Green Valley Media (Executive Producer) has been documenting the culture of human rights since 1974. E.W. Stetson (Executive Producer) has produced documentaries and features on topics ranging from environmental issues to affordable housing and many overlooked facets of U.S. political history.